In 2000-2013 served as a Special Advisor of the President of the European Bank for Reconstruction and Development and Governor of EBRD, Founding President of the Eurasia House International, Founder and Director of the Eurasia Centre at the Cambridge University’s Judge Business School, Chairman of Global Council on Energy Security (WEF Forum), Vice Chairman, Emeritus of the East West institute (EWI). He also became the Founder of the High Power Annual Conference at the Cambridge University Commission, member of the Euro-Atlantic Security Initiative (Chair of Energy Security), the Founding President of the British-Armenian All Party Parliamentary Group, Board Member of the Global Leadership Foundation (GLF), member of the Dean’s Advisory Council at the Kennedy School of Government, Harvard University; member of the Dean’s Advisory Council at the Harris School of Public Policy Studies, University of Chicago; John Smith Trust member, London, UK; Board Member of the Armenian General Benevolent Union, Founder of the Yerevan, My Love Benevolent Foundation, etc. 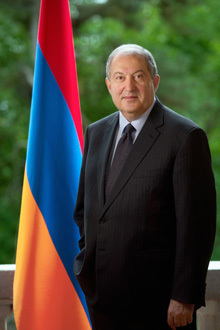 In 2018 Mr. Sarkissian was awarded with the highest Italian award - Knight of the Grand Cross Order of Merit of the Italian Republic.